These handy Removable Labels stick firmly but remove cleanly for easy updates. Label drawers or containers to identify the contents. Mark your name on small household or office objects. Use them as discreet price tags. 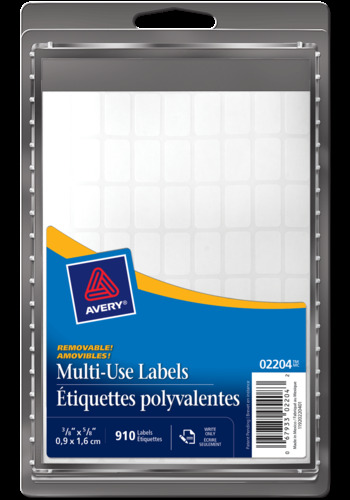 The labels' small size makes them highly versatile for use in any number of situations. Label Size ⅝" x ⅜"
Labels stay put until you want to remove them. The perfect solution when you need to identify boxes, shelves, drawers and more but want the freedom to change and move things around. Adheres to most smooth surfaces including paper, cardboard, plastic, wood, glass and metal.